Check out this adorable addition to our vast collection of machine embroidery designs! 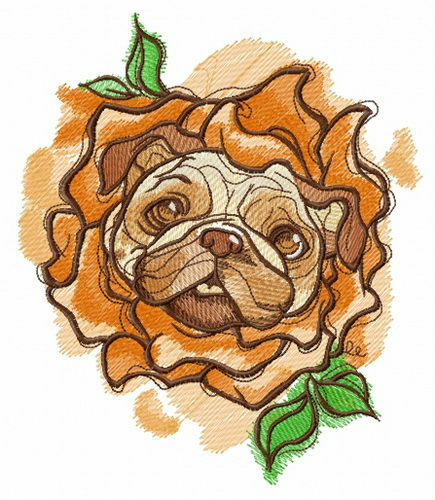 This needlework features a cute pug surrounded by a lush rose flower. The color palette in this design comes as a combination of honey, pumpkin, harvest green, ashley gold, ivory, dogwood, hazel and aspen white. This funny and original needlework will be such a tremendous addition to any of your favorite belongings! Use it to decorate hoodies, T-shirts, sweaters, pajamas, towels, bathrobes, blankets, cushions, quilts, shopping bags and much more. It works perfectly with most suitable fabrics. What a pretty pug-dog! embroidered it recently. my sister adores the dogs and I've decided to sew a nice handbag for her birthday. Went out cute and she loved it very much and wears the handmade gift every day. thanks for digitizing the pattern!Great purchase. Would love to see a similar design using french bulldog! Yes, it is real, we will give the task to our artist to draw such a picture, follow our social networks or community .. We would discuss the sketches there.